Everyone reading this blog will agree with me with the fact that even though vision and passion are the two pillars on which every company sets its business but the major asset that acts as a driving force to make your company emerge with flying colors is the human capital. Many experienced professionals have already claimed and are time and out shedding light on the role played by manpower in yielding the apt business goals and statistics. Well, by far all of you must have come across the term ‘recruitment process outsourcing’ (generally abbreviated as RPO), which has grabbed the eyeballs of the corporate world right from its advent into the area of management and HR business. As per the current scenario, most of the companies are finding it difficult to simultaneously handle the business development processes and the recruiting functions due to time constrain and accessibility to various allied resources that are necessary to construct a relevant candidate profile or fall short of the accurate hiring space with respect to their brand identity. And, this is where HR companies or recruiting consulting agencies have cashed in the most along with building a strong bond with the business companies by redemption of valuable and trustworthy employer outsourcing services or recruiting process. One should always keep in mind to go through the overall profile of the external recruitment service provider before zeroing down on the best recruitment process outsourcing firm because the task in question is to find the apt candidate for your company. And, choosing out the recruitment company whose prime objective and sole aim revolves around providing a strategic and professional outsourcing solutions by hiring the best talent from the lot and managing each level of recruitment in a streamlined and effective way. 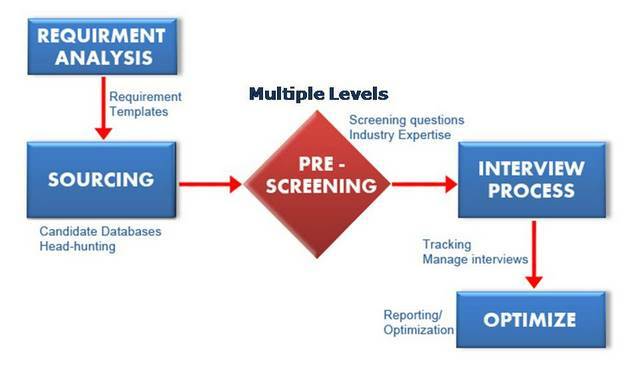 The common or by-default set services and features catered by any RPO agency should include an extensive range of broad spectrum hiring solutions including the latest technological skills, recruitment software, years of experience and knowledge in the related field and various essential tools and processes. While, the best part is that the client company is free to choose from a wide list of recruitment process outsourcing services that include complete RPO solutions, only sourcing services, partial RPO approaches, etc to name a few.